I hesitated to post this review on my blog because it is rather long. However, since it is graduation season and Father's Day is coming up, I urge you to consider purchasing it as a gift or as reading for your summer vacation. You will not be disappointed!
" 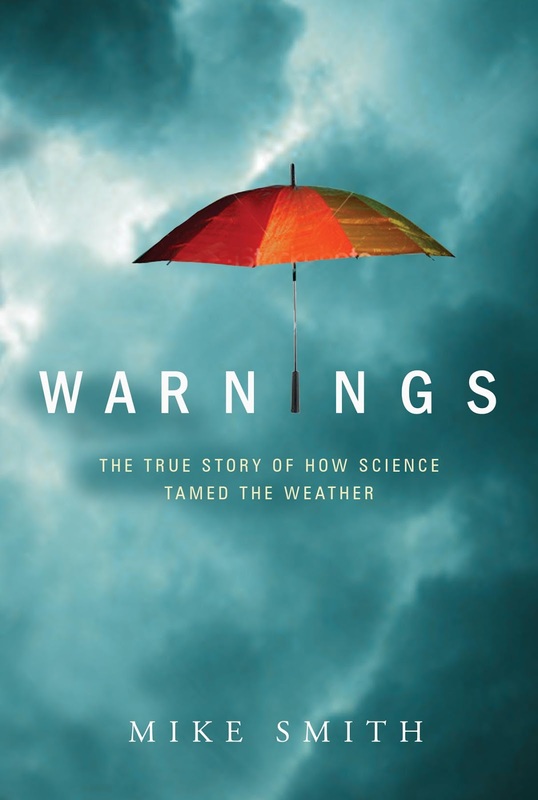 Warnings: The True Story of How Science Tamed the Weather " is a fantastic book that captures the evolution of meteorology through the personal accounts of Mike Smith. Like the perfect storm in which converging elements collide, this book is part memoir, part science and all real. This wonderful 304 page-book is composed of the following twenty-three chapters: 1. The Ruskin Heights Tornado, 2. No One Ever Knew it Was Coming, 3. "Nice People, But Odd", 4. The Government Gets in Gear, 5.The "Town That Died In Its Sleep", 6. The Paul Revere of Grandview Junior High, 7. The End of the Beginning, 8. Storm Chasers, 9. Tragedy, 10. Fujita, 11. The Day TV Weather Grew Up, 12. St. Louis and the Holiday Weather Hotline, 13. The Microburst Mystery, 14. Delta 191: Why Weren't They Warned, 15. The Delta Trial, 16. Weatherdata, 17. America Gets Dopplerized, 18. Hurricane Andrew, 19. Katrina: Part One, 20. Katrina: Part Two - Inaction In Action, 21. Katrina: Part Three - Murder By Bureaucracy, 22. Greensburg: Capstone of the Modern Warning System, and 23. Where There's Life, There's Hope. In summary, Mr. Smith "blew" me away with this book. A unique scientific book that reads like a great mystery novel and educates like an encyclopedia. This book was a real treat to read. It starts off with Mr. Smith's prodigious knowledge in meteorology, his passion for his work and his innate ability to convey such experiences in an engaging manner. Bravo! I can't recommend this book enough! *Since writing the book, I learned there was an earlier broadcast in Wichita Falls and another weeks before my broadcast. I have corrected the record wherever I can.